Russell Madams has named the date for the Buttermere 34k Round, Sunday 17th February, 2019. Buttermere Round is a hilly 34km course taking in the Borrowdale and Buttermere valleys. 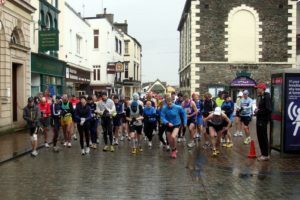 The run starts at 11am prompt from Keswick Moot Hall in the centre of Keswick before heading out of town past Derwent Water and into the Borrowdale Valley. Just after Seatoller the course starts the first of two big climbs up Honister Pass before descending down to Buttermere and then climbs up a big hill before descending once more, into Newlands Valley. The course then returns to Keswick via Stair and Portinscale villages. More HERE. Meanwhile, Lyn Thompson has been hatching a plan for a relay to end all relays, the 10in10 route 10 times in 24 hours… she says..
As some of you may know, I brought up a proposal at the AGM that the Ladies should have a go at a relay event, the 10 in 10 x 10, with two ladies to each round, ie a minimum of 20 ladies, with the aim of completing the whole relay in under 24 hours. Two pairs of runners, ie 4, would set off at the allocated start time, with the first pair to finish to hand over to the slower pair waiting, and the second pair to hand over to the faster pair. This would mean that the event should finish within the 24 hours, it would give more interest to all participants, any spectators/helpers, and the people manning the check point at Buttermere. 2. Give club members who don’t normally make a relay team a chance to participate. 3. Raise money for MS, each runner contributing a minimum of £35, the cost of taking part in the actual 10 in 10 event. On the suggestion of Cat I have spoken to Rachel about setting up a ‘Just Giving’ page, which she is enthusiastic to do. Some runners will simply donate their own £35. 1. The event will not be run under FRA regulations, but, of course, all runners are expected to take the appropriate kit and be familiar with the course. 2. The round is approximately 16 miles with 7000’ of ascent, starting and finishing at the Swinside, and takes in the 10 peaks of Causey Pike, Sail, Crag Fell, Wandope and Whiteless Pike before dropping down to Buttermere. Then High Snockrigg, Robinson, Dalehead, High Spy, and Maiden Moor. There is a route map on the 10 in 10 website. The route follows main paths, although there are some minor shortcuts, and the second half is harder than the first half. 3. Only Keswick AC registered runners on the team. Friends can pair themselves up, or we will try and pair runners. 4. I guesstimate that the average time for each pair will be 4.5 hours, with some taking 6 hours and some 3 hours. This is not a race, but participants are expected to put in some effort at whatever speed . 5. 4 pairs of runners will be needed for the night section. Cat and Jo have already volunteered to one of the 4 pairs needed. 6. The start date is Friday, 31st May, a time to be decided, but likely to be in the afternoon, finishing the afternoon of Saturday, 1st June. If the weather is bad the event will be delayed a day. If the weather is terrible it will be postponed! 7. There will be no marshals, except for the check point at Buttermere, where there will be some cake and squash available. Some men have already volunteered to help here. 9. I have been in touch with Yvonne Booth and she is absolutely fine with us going ahead.